We went to Kenduli Mela (Baul Mela) by a packaged tour organized by WBTDC. It is held on the auscipicious occasion of birth anniversary of Poet Joydeb. Here the largest numbers of Bauls, Fakirs come at different akhras(tent) to sing. We took a train to go to Shantiniketan.From their WBTDC took us to their WBTDC Tourist lodge. After lunch we went to the Mela site by the car of WBTDC. We stayed there upto 1230 pm. There is hardly anything to eat or drink. The crowd is not controlled and there is no police to control the traffic.I must say it is highly mis organized. It is not recommendable for that reason. The mela however was very interesting. A saint blessing Mohua and also composing a song for her instantly. The origin of the word is Baul is debated. Some modern scholars have suggested that it may be derived either from Sanskrit word vatula, which means(divinely inspired) insane or from vyakula, which means impatiently eager and both of these derivations are consistent with the modern sense of the word, where a person can realize his union with the eternal beloved - the Moner Manush (the man of the heart) .So the word " Baul " refers to three terms : betul, vayu and âuliyâ, a term of Arabic origin, which means " saint ", " holy man ". The origin of Bauls is not known to any great degree of accuracy, but the word Baul has appeared in Bengali texts as old as the 15th century. The word is found in the Chaitanya-bhagavataof Vrindavanadas as well as in the Chaitanya Charitamrita of Krishnadas Kaviraj. Some scholars, however, maintain that it is not clear when the word took its sectarian significance, as opposed to a synonym for the word mad. Bauls are a part of the culture of rural Bengal. Whatever their origin, Baul thought has mixed elements of Tantra, Sufi Islam, Vaishnavism and Buddhism. They are thought to have been influenced by the Hindu tantric sect of the Kartabhajas as well as Tantric Buddhist schools like the Sahajia. The baul were recorded as a major sect as early as mid 18th century. Bauls can come from a Hindu or a Muslim background ; in both cases, they are usually rebels against orthodox practices and social institutions. The reason of that is purely spiritual : they are continuously searching for Adhar Manush, the " Essential Man ", the inner being which is inside of each human body. Baul music celebrates celestial love, but does this in very earthy terms, as in declarations of love by the Baul for his boshtomi or life mate. With such a liberal interpretation of love, it is only natural that Baul devotional music transcends religion and some of the most famous baul composers, such as Lalon Fakir, have been of Muslim faith. Though research says he was a Hindu when he was born. Originally, the Bauls were nonconformist, who rejected the traditional social norms to form a distinct sect that upheld music as their religion. "Baul" is also the name given to the genre of folk music developed by this creative cult. It's easy to identify a Baul singer from his uncut, often coiled hair, saffron robe covering their body from the shoulder to below the knees (alkhalla), a turban on their head and a mark on their forehead. necklace of beads made of basil (tulsi) stems, and of course the single-stringed guitar (ektara). The costume of the Bauls is very simple. Fakir Bauls prefer plain white cotton. Bauls live like a community, and their main occupation is the propagation of Baul music. But they are the most non-communal of all communities: They have no religion, for they only believe in the religion of music, brotherhood and peace. Predominantly a Hindu movement, the Baul philosophy weaves together different Islamic and Buddhist strains as well. Moner Manush - Music of the Heart! Bauls croon from their hearts and pour out their feelings and emotions in their songs. But they never bother to write down their songs. Theirs is essentially an oral tradition, and it is said of Lalan Fakir (1774 -1890), the greatest of all Bauls, that he continued to compose and sing songs for decades without ever stopping to correct them or put them on paper. It was only after his death that people thought of collecting and compiling his rich repertoire. he created more than 5000 such songs. Lalan Fakir was at the same time a revolutionary and a holy man. 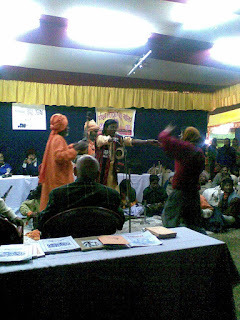 Many Baul gurus were and still are also poets ; In this poetry, the outer meaning looks sometimes very materialistic ; but the inner meaning, which is not accessible to everyone, includes teachings related to notions such as doctrine of the creation of the world, doctrine of the soul, doctrine of the body, doctrine of love etc. The musical culture and life style of the Bauls has inspired village life in Bengal so deeply that Bengali people have protected Baul practitioners for many centuries. Chaitanya Mahaprabhu (13th Century) was the greatest known Baul singer, and he travelled all over India. History counts him as the biggest influence among Baul poets and singers of later generations. The Bauls uses poetry, dance and singing as tools to reach that goal. Therefore Bauls travel from village to village and sing for the people who would give them alms for the maintenance of their everyday life. Music is their only source of sustenance It is said that Bauls would accept only what they needed and refuse anything more than the strict minimum. Their only possessions were their clothes and musical instruments, as well as their songs and secret practices. Bauls always sing and dance together in such a way that the mind melts into the soul in a harmonious way. Bauls use a variety of indigenous musical instruments to embellish their compositions. The "ektara", a one-stringed drone instrument, is the common instrument of a Baul singer. It is the carved from gourd, and made of bamboo and goatskin. Other commonly used musical instrument include "dotara", a multi-stringed instrument ; "dugi", a small hand-held earthen drum; leather instruments like "dhol", "khol" ; chime tools like "ghungur", the bamboo flute etc. Bauls are to be found in the Indian state of West Bengal and the country of Bangladesh. The Baul movement was at its peak in the 19th and early 20th centuries . Originally, the district of Birbhum in West Bengal was the seat of all Baul activity. Later the Baul domain stretched to Tripura in the north, Bangladesh in the east, parts of Bihar and Orissa in the west and south respectively. In Bangladesh, the districts of Chittagong, Sylhet, Mymensingh and Tangai are famous for Bauls. Travelling in local trains (especially to Bauls) and attending village fairs are a good way to encounter Bauls. 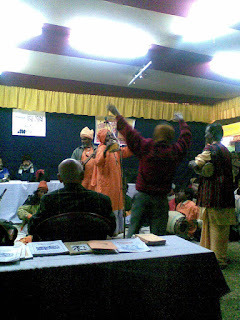 Bauls from far off places come to participate in the Kenduli Mela and the Pous Mela (much better organized- held in end of third week of December)- the two most important fairs held in West Bengal for Baul music. However one of the biggest festivals for this cult of wandering minstrels is held in the month of January (normally 14th ) at Kenduli in the Birbhum district, a four-day fest organised in memory of the poet Jayadeva. It's hard to think of Bengali culture sans the Bauls. The theme that Bauls deal with in their lyrics is mostly philosophical in the form of allegories on the state of disconnect between the earthly soul and the spiritual world. Often they philosophize on love and the many-splendoured bonds of the heart, subtly revealing the mystery of life, the laws of nature, the decree of destiny and the ultimate union with the divine. Even today, most Bauls live in small huts ; they live in couples but are not supposed to have children : mostly they adopt abandoned children to whom they teach everything they know. Twice a week, they go to villages to collect food (mostly rice and vegetables). Sometimes they travel from one village to another in order to meet other practitioners. Most of them are also linked to non-singing gurus who teach them different spiritual practices (sadhana) and songs with an inner meaning. The living space of Bauls is called akhra ; it is somehow like an ashram, with the difference that men and women live together, considering each other as spiritual partners. Most akhras are also meeting places for other sadhakas and sadhikas, male and female practitioners, as well as for sadhus, holy men, wherever they come from. Bengal's greatest poet the Nobel laureate Rabindranath Tagore wrote about the Bauls: "One day I chanced to hear a song from a beggar belonging to the Baul sect of Bengal...What struck me in this simple song was a religious expression that was neither grossly concrete, full of crude details, nor metaphysical in its rarefied transcendentalism. At the same time it was alive with an emotional sincerity, it spoke of an intense yearning of the heart for the divine, which is in man and not in the temple or scriptures, in images or symbols... I sought to understand them through their songs, which is their only form of worship. Who can't trace the influence of Baul songs in Tagore's Rabindra Sangeet? Rabindranath Tagore put the Bauls on a higher-than-respectable level by his praise of the beauty of their songs and spirit, and by his frank and proud acknowledgement of his own poetic debt to them. The Baul pattern also inspired many other successful poets, playwrights and songwriters of the 19th and 20th centuries. Bauls are poets, composers, musicians, dancers and actors all rolled into one and their mission is to entertain. Through their songs, pauses, gestures, and postures they spread the message of love and ecstasy to lands far and wide. In a land devoid of mechanical entertainment, Baul singers were a major source of entertainment. People still love to watch them sing and dance, their narration of folk tales, and even commentary on contemporary issues through highly melodious songs and an extraordinarily high-pitched rendition. Although their lyrics speak the language of the village folks, their songs are appealing to one and all. The songs are simple and direct, profusely emotional, enjoyable, and needs no special knowledge for appreciation. Lalan Fakir is considered the greatest Baul artiste of all ages, and all other later Bauls regard him as their guru, and sing songs composed by him. Among the contemporary Baul singers, the names of Purna Das Baul, Paban Das Baul are prominent. Purna Das Baul is undisputedly the reigning king of the Baul clan today. His father, the late Nabani Das "Khyapa", was the most famous Baul of his generation, and Tagore conferred upon him the title "Khyapa", meaning "wild". Purna Das was induced into the folds of the Baul music from his early childhood, and at the tender age of seven, his song won him a gold medal at a music conference in Jaipur. Referred to as the Baul Samrat, Purna Das Baul, introduced Baul songs to the West during an eight-month tour of the US in 1965 with stars like Bob Dylan, Joan Baez, Mick Jagger, Tina Turner, et al. Dubbed "India's Bob Dylan" by the New York Times in 1984, Purna Das Baul has played with Bob Marley. Along with sons Krishnendu, Subhendu and Dibyendu, Purna Das Baul is also optimistic about a show with Bob Dylan, the long-time friend of Baul gaan. The famous French Theatre de la Ville invited the global Baul band 'Baul Bishwa' group at its Musiques de Monde (the World Music) meet in Paris. Led by Bapi Das Baul, an eighth generation baul artiste, the group has performed at several places around the world. In this context, the collaborative effort of Paban Das Baul and the British musician Sam Mills ("Real Sugar") to produce Baul fusion music for a global audience is discernable. In 2005, the Baul tradition was included in the list of "Masterpieces of the Oral and Intangible Heritage of Humanity" by UNESCO. Did you know that Paban Das's music has also been used by Microsoft to represent the music of Bengal in its World CD-ROM Atlas? Next day we went for a short tour of Shanti Niketan.It was really nice.